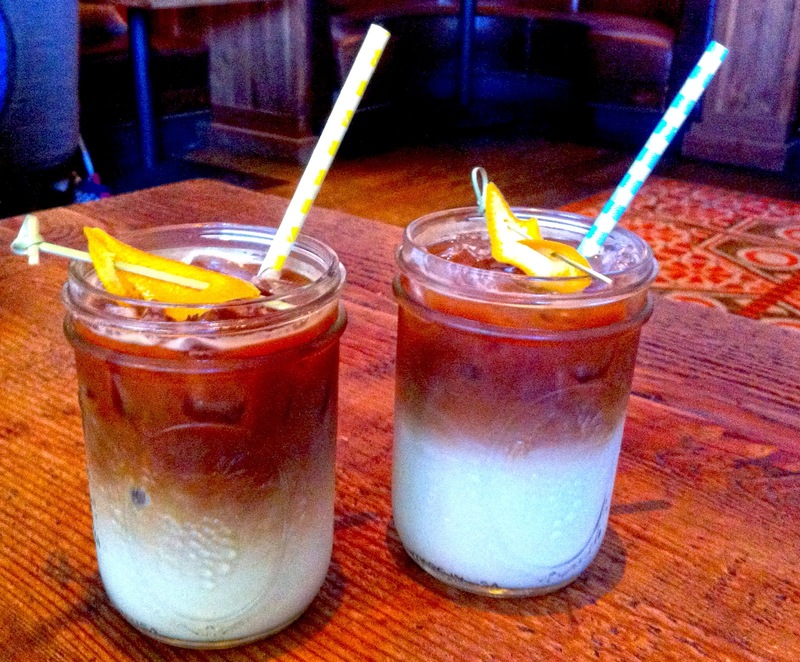 That's just a photo of the creative and refreshing iced lattes Finch & Fork is serving, made with Earl Grey and orange and a salute to summer in a Mason jar glass, as I ate the fine food too quickly to be able to take photos. But it's simple as this--if you're looking for a wonderful brunch any weekend, go enjoy what chef James Siao is serving at the corner of Carrillo and Chapala. My bet is you won't stop to take photos, either. One of the lures for the brunch is a bottomless mimosa for $12 (that might be too well enjoyed by that table-full of 20-year-olds, but at least they have good taste while they're too loud), but the obvious reason to come is for the food, that's both comfort food and made with a bit more care than you could or would in your own kitchen. Part of that is they do a bunch of things from scratch at F&F, and part of that is a pleasing precision, especially in plating that is festive yet never fussy. This is good simple food that looks simply good. For instance, there's the short rib and sweet potato hash, eggs done to your liking, horseradish, chimichurri, and a sprinkling of frisee. The sweet potatoes are served in bite-sized cubes, just the right tenderness but far from mushy, and soaked through with some of that long-braised short rib juice. The meat, as a short rib should be, is fork tender and full of flavor. It all gets just enough zip from the horseradish, some zing from the chimichurri, and then the eggs pour their yolky goodness in, too. We're talking a very rich dish, but a perfect ballast for your day. And the frisee adds just enough of a lettuce palate cleanser effect, some neutral crunch the plate needed. Have that with a bloody Mary from the bar (you call your vodka and can make your own with all sorts of sauces and accoutrements, including bacon) and your day couldn't be off to a better start. Or you can try the F&F's elegant take on a benedict, with Dungeness crab and asparagus over brioche. (There's that level that makes it more than you'd do at home.) It comes out almost looking like a salad, with a handful of greens atop the chopped asparagus and the eggs and brioche, but that again lightens the rest of the heavier, fuller flavors. Pretty clever and totally delicious.